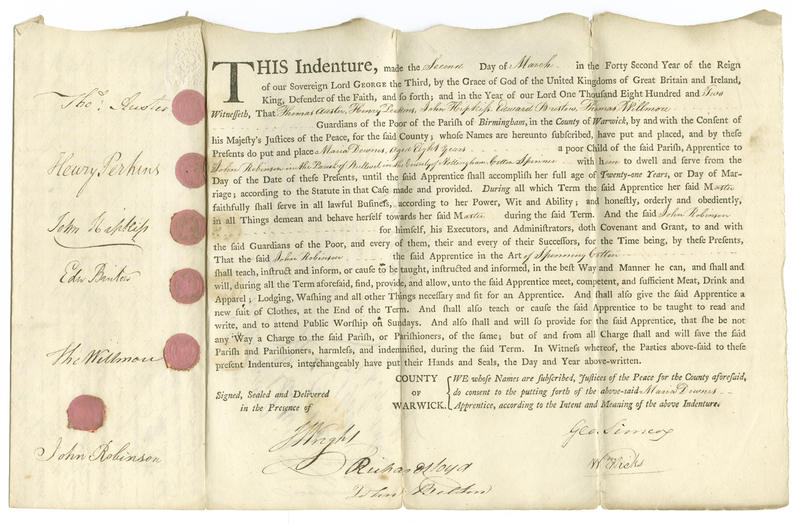 Birmingham Archives & Heritage has an extensive number of apprenticeship indentures, especially from the 18th and 19th centuries. Indentures were legal documents signed by the apprentice and their master to agree the conditions of apprenticeship. They were originally drafted on a single piece of paper that was cut in half so that the legitimacy of the apprentice could be confirmed by putting the two halves together. Before legislation was introduced to prevent child labour, apprentices were usually children in their early teens, although many were younger, particularly those working in textile manufacturing. In return for cheap labour they were offered board, lodging and training. MS 871 includes the indentures for five girls under the care of the Guardians of the Poor in the Parish of Birmingham in 1802: Sophia Tonks, aged 14; Maria Stretton, aged 13 ½; Catharine Stretton, aged 11; Ann Woodcock, aged 10 ½ and Maria Downes, aged 8 years old. All five were apprenticed to John Robinson of Nottinghamshire. Robinson’s father, George Robinson, had come to the area in 1737 and, with the help of his two sons, John and James, established a number of cotton mills along the river Leen on a stretch from Pamplewick to Bulwell. Many of the workers in textile mills were children and they were often ill-treated, forced to work long hours and inadequately fed (‘The Leen Mills’, Lenton Times, issue 4, June 1990). Indeed, children as young as four could be found working in mills, usually as scavengers forced to go under the working machinery to retrieve parts and materials. From around the age of eight they would work as ‘little piecers’, a very dangerous job which involved leaning over the spinning-machines to repair any broken threads. At around age fifteen they would be employed to operate the machinery. In 1800 there were approximately 20,000 apprentices working in cotton mills. In the same year that the five girls from Birmingham were apprenticed to Robinson, the Factories Act 1802, also known as the Health & Morals of Apprentices Act, was passed to prevent pauper children from working more than twelve hours a day at the mill. In 1819 legislation was introduced which prevented children from under the age of 9 working in cotton mills; this was extended to factories in 1833.